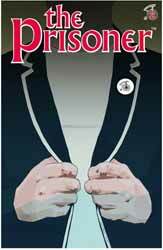 It’s the new Number Two – or rather #2 of Titan’s new Prisoner comic book. This episode is decidedly more Prisoner-ish than the last one had been. Whereas #1 felt stylistically like a very different and more modern kettle of fish, much of #2 feels like a pastiche of the offbeat original. Though there are a few more current references, such as the use of a video remote control, writer Peter Milligan (working from a story by David Leach) throws in numerous familiar elements, including the Village’s courtroom, its human-size outdoor chessboard, the beach, a whole bunch of balloon-like Rovers, and a fistfight between the hero and some hapless guards. As the new Number Six finds himself echoing his predecessor’s catchphrase about not being a number, there is a meta moment as he thinks to himself, “I suddenly feel like an actor, repeating lines said by another man.” In a surreal flashback / hallucination scene, we even see Number Two astride the show’s famous penny-farthing bicycle. Amid all these deliberate mind games, however, there is also some (presumably) unintentional confusion. The Number Two from the dream sequence also appears as the courtroom judge (at least, it looks like him to me), but he consistently refers to Breen as Number Two rather than Number Six. In a lettering error in another scene, Breen’s superior, Section, speaks a line that is clearly intended for Breen himself. On the plus side, the look of the television show is well captured by artist Colin Lorimer, who provides plenty of moody close-ups and expressionistic Dutch angles, while Milligan delivers a cliffhanger that will have you counting the days until Number Three.